The London Bridge Trio is one of Britain’s leading chamber ensembles, known for their deeply nuanced and searching interpretations. The trio originally formed in 2002 as the London Bridge Ensemble and they continue to prioritise strong, composer-led programmes and collaborate with regular guest artists. Their name reflects an admiration for English music of the early twentieth century, which forms part of the group’s varied repertoire and is represented by their hugely successful Frank Bridge recordings. 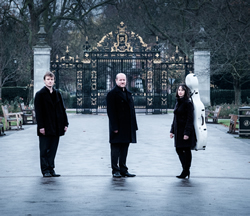 Over recent years the trio has appeared frequently in London with Wigmore Hall and Kings Place concerts as well as a residency at St John’s Smith Square, entitled ‘Brahms and his World’, which represented four aspects of his composing life with mixed combinations and song. Their concert of Czech music at Champs Hill in Sussex was broadcast live by BBC Radio 3, and their concerts at St George’s Bristol were broadcast as a series of BBC Radio 3 Lunchtime Concerts. Thought-provoking pre-concert talks and lecture-recitals are something the trio is increasingly known for, and their collaboration with Richard Wigmore continues, exploring together the influences, connections and history of works by Mozart, Schumann, Mendelssohn and Brahms. The group has also appeared at venues including Queen's Hall, St George’s and the Ponte de Lima Festival (Portugal). In 2008 the ensemble founded its own festival, the Winchester Chamber Music Festival, in the hometown of their cellist Kate Gould. They now welcome capacity audiences each year in late April/early May and have secured their reputation for stylish programmes involving exceptional international artists. In 2018 they were joined by the Heath Quartet and baritone Ivan Ludlow for a series of sold-out concerts. Guest artists have included the Gould trio and the Navarra quartet as well as members of the Elias Quartet and Kungsbacka Trio. The ensemble’s recordings of works by Frank Bridge were released by Dutton and met with plaudits from the critics, including unreserved commendations from Gramophone Magazine, International Record Review, American Record Guide and BBC Radio 3 (CD Review). Their second Bridge disc was shortlisted for the Gramophone Chamber Music Award 2011. Their Schumann recording for Sonimage Classics drew observations such as "rendered with a bubbling brilliance", and "heart-touchingly eloquent" from the Sunday Times. A collection of works by Fauré followed on Sonimage Classics, and received excellent reviews from both The Strad and Gramophone magazines. 2018 plans include the completion and world premiere of a new work for piano trio, ‘Hidden Agenda’, written for the trio by Colin Matthews, and visits to the Sacconi Festival in Folkstone, the Penarth Chamber Music Festival and the Birmingham International Piano Chamber Music Festival, as well as performances across the UK. Their first recording with new violinist David Adams is planned with SOMM Records: works by Clara Schumann and Fanny Mendelssohn.